Forward thinking professional car wash investors and owner/operators partner with Sonny’s because of its total offering, leadership, and expertise. 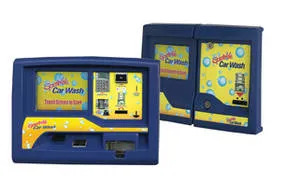 Sonny’s education and software products support profitability and its conveyorized car wash innovations, parts, and supplies keep a wash business growing. 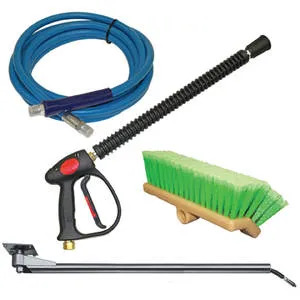 What’s New/Best Seller • Sonny’s has a wide selection of self-serve equipment including the Bi-Level Fountain Prep Brush, Complete Spray Gun, and the WAE Series Wall Boom. Advantages/Features • The Bi-Level Fountain Prep Brush features densely filled flagged-tip bristles staple-set in a bi-level foam block; 10” width, 2.5” bristle; green polystyrene; and accepts 15/16” diameter handles. The Complete Spray Gun Assembly Nozzles features no weep; 8 gpm; 4,000 psi; maximum temperature 300°F; and includes gun, wand, and nozzle protector. The WAE Series Wall Boom sports a high-pressure wand/ceiling boom with a 360º continuous rotation; 180º foam brush/wall boom rotation; and variable self-park feature. What’s New/Best Seller • Simoniz Self-Serve Tire Shine. Advantages/Features • The Simoniz Tire Shine with airbrushing effect features a durable and easy-to-use wand applicator. The system combines fluid and air at the tip of the wand, applying chemical efficiently with atomizing mist. 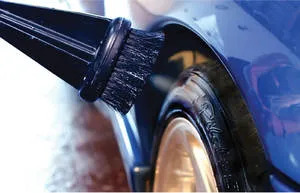 The direct application delivers shiny tires without the vac island mess, while the unique bristle design spreads chemical evenly. Bristles adapt to all tires and hold a precise level of chemical — no freebies. 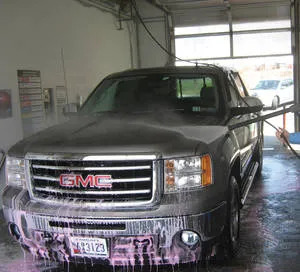 Carolina Pride Carwash Systems and Solutions has been providing car wash operators throughout North America with industrial grade wash systems for over 50 years. Carolina Pride offers many services, including car wash payment and management systems, Turbo Dry, Performa, Express, and the newest OPTIMAX Series of self-service wash equipment. In addition, the company offers its Tunnel Solutions line of equipment, which includes the popular Solution Control Center and Motor Control Centers, spot-free rinse systems, vacuum stanchions, and an online car wash academy. What’s New/Best Seller • The Monitor. Advantages/Features • The Monitor shows what services customers are buying so operators can target marketing to increase sales. The Monitor is programmed to record the number of minutes a function from a single bay is activated. It counts the number of times a timer has been started, how long it has been running, and how long each of the functions have been running. The solution can be used to find out how popular functions are compared to others over a period of time. It is resettable, allowing the operator to see how new services or marketing efforts affect sales by service. Innovative Control Systems’ passion is to leverage its experience as car wash operators, position as a market leader, and ability to incorporate advanced technology into visionary products which enables its customers to differentiate their operations, achieve a distinct competitive advantage, and maximize their earnings. What’s New/Best Seller • Auto Sentry Central Payment Terminal (CPT). Advantages/Features • Auto Sentry features include the ability to: activate any bay or vacuum directly from the CPT; generate a code to activate any bay or vacuum for a preset amount of time; use the mobile application to activate any bay or vacuum; accept cash and coin in the bays and vacuums; accept cash, coin, credit/debit/gift cards, Android Pay, and Apple Pay; dispense coin and/or bills to act as a change machine or bill breaker. More than an app, it’s a tool to help grow your business. What’s New/Best Seller • T4WIM100 Interface Module. Advantages/Features • Touch4Wash offers mobile payment and activation options for the self-serve bay. The system is configurable for count down or count up operation. Touch4Wash is also equipped with the ability to include self-serve bays in loyalty and membership programs. 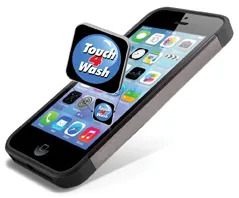 Touch4Wash built-in remote activation reduces the hassle of customer service. Simply activate the equipment from wherever you are to ensure the best experience for your customer. The system is simple to install and works with your current meter box, no need to upgrade your equipment. Hardware costs $500 per interface module. Each module can operate four self-serve bays. Coleman Hanna Carwash Systems has been in the car wash business for more than 50 years providing expert knowledge in manufacturing quality equipment as well as creating innovative products that enhance the car wash experience. What’s New/Best Seller • U WASH IT Compact Self-Serve Car Wash.
Advantages/Features • The U WASH IT is a compact self-serve car wash with a wide variety of wash cycle features including tire cleaner, presoak, wax, and high-pressure soap. The system comes standard with a self-contained pump for the equipment room and choice of 360-degree or wall mounted 180-degree boom. Customer/Operator Support • Worldwide distribution network. Rowe has been a trusted source for reliable bill changers since 1962. What’s New/Best Seller • BC1600 and BC-1500. Advantages/Features • The BC-1600 rear load and BC-1500 front load bill recycler and changer product lines update and replace the 400RL. The BC-1600/1500 models feature a strong cabinet and door constructed of 12-gauge powder coated steel with secure Medico T handle and “safe-like” three-point door lock system. These BC1600/1500 units still feature the popular and successful MEI bill recyclers and same high capacity 5,600-quarter hoppers. Every unit includes remote text message and e-mail alerts such as coin hopper low/bill jam using free WiFi or Ethernet connection, as well as a user-friendly computer screen with two accounting menus. Serving the vehicle washing industry for over 40 years, GinSan Industries has established and been designated as a premier manufacturer of self-service vehicle washing equipment, vacuum systems, and water treatment products. GinSan Industries offers additional personalized services such as site/equipment consultation, stainless steel fabrication, and custom product/graphic design. What’s New/Best Seller • ULTRA VFD Self Service Carwash System. 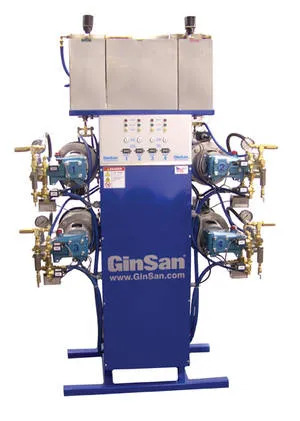 Advantages/Features • The GinSan ULTRA VFD Self Service Carwash System is a second-generation product designed from the foundation of the Ultimate and ULTRA belt driven systems. The unit utilizes high efficiency 5-hp motors paired with industry leading pump manufacturers such as General, Arimitsu, and CAT. Each system is assembled with seven function offerings and an independent foam brush system controlled by cutting-edge VFD technology that offers delivery pressures from 100 to 1,500 psi. The system is activated and communicates with the Lumitouch ULTRA meter boxes utilizing industry-leading components such as Crypto Pay, Hamilton D.A.N., and the Unitec Wash Pay credit card systems. Customer/Operator Support • International distribution network and weekly technical service support from 8 a.m. to 5:30 p.m. EST. Doyle Vacuum Systems is dedicated to producing the highest quality, best performing, and most reliable equipment available on the market. Doyle manufactures and distributes a full line of coin-operated and free-use systems, including a variety of vacuum machines, fragrance machines, shampoo machines, air machines, warm-air blower/dryer machines, and commercial grade portable wet/dry vacuums. Further, Doyle offers custom design and fabrication services to meet specific needs. What’s New/Best Seller • Fresh Impressions Multi Combination Machine: Vacuum, Shampoo, Spot Remover, Fragrance. Advantages/Features • Fresh Impressions offers customers a full line of service options to detail the interior of their vehicle. Like all of Doyle’s machines, these vacuums utilize cartridge filters (not bags) and a convenient 5-gallon bucket for a dirt receptacle. Dirt builds up on the exterior of the cartridge filters (which can be easily cleaned), and then drops through a funnel plate into the bucket down below for simple removal. Cleaning out a vacuum is never going to be fun, but this system makes the job a little easier. The innovative design of the machine allows easy access for cleaning and maintenance — one service door provides easy access to pumps and chemicals, and the other access to the dirt and filter compartments. For over 30 years, Hydro-Spray has been a leader in the self-serve car wash industry. Hydro-Spray integrates innovative technology into dependable, flexible car wash equipment that adds value and enhances the self-serve car wash bay. What’s New/Best Seller • Elite Pro Self-Serve System. Advantages/Features • The Elite Pro was designed with emphasis on the consumer experience in the self-serve wash bay. With advanced control over delivery pressure, higher pressures can be achieved across all functions in the bay. Integrated chemical solution tanks promote consistent cleaning results. The Elite Pro comes pre-tested, pre-plumbed, and pre-wired with fewer system components making it easier to use and install with reduced maintenance. 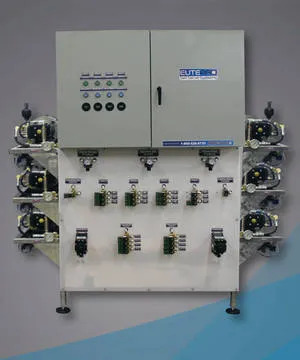 Standard features include: one bay, one pump design; up to six bays per system; flexible multi-pressure delivery; 5-hp three phase motor; stainless steel frame; nine individual solution tanks; gravity feed to pump; and pre-plumbed supply connection. CustomKraft has over 35 years of experience manufacturing self-service car wash equipment. CustomKraft’s patented MultiPressure System, single pump design is offered in the bypass and variable frequency drive (VFD) design. Bay selections initiate at high pressure then change to owner pre-set pressures — supporting customer satisfaction with 400 percent faster product delivery to bays. What’s New/Best Seller • Wash Me Express. Advantages/Features • Like all CustomKraft Systems the Wash Me Express offers: a single delivery line per boom with no in-bay check valves; credit/debit/fleet card, coin, token, and/or bill start up; simple installation with pre-plumbing and pre-wiring; Super E motors and Weepmiser freeze protection on stainless steel frames; operation with any input voltage from 200 to 600 VAC single or three phase; straightforward design using color-coding and lighted connectors; and a smaller footprint with easy access to parts. The system is 36”wide x 30”deep x 80”tall, available in one-or two-sided independent equipment design. Customer/Operator Support • Nationwide and global distribution. CustomKraft provides two-year limited warranty, free training seminars, illustrated manuals, and online or toll-free technical support. Price • Free quote upon request. North Little Rock, AR 72117.
dedication to manufacturing superior mat cleaners has brought it worldwide recognition. Its mat cleaners are currently operating in the U.S., Canada, Asia, and Europe. 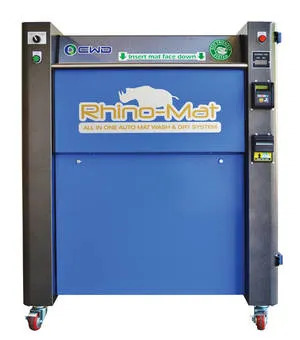 What’s New/Best Seller • Rhino-Mat Wash & Dry System. Advantages/Features • In a one-step process, Rhino-Mat effectively cleans and dries rubber and carpet floor mats within 30 seconds. Using water and the power of a special textured brush to clean ground-in dirt, hard-to-remove stains, and pet hair, finishing off with a patented drying technique and groomed appearance. 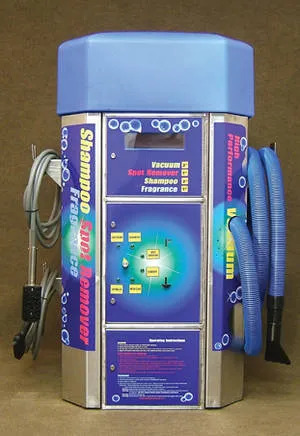 The D&S line of self-service car wash equipment includes the new IQ Self-Wash and Space Saver Series, Stack and Mini-Stack; modular car wash systems; spot-free rinse systems; wall-mount low-pressure pumping systems; and stainless steel bay components such as booms, wand holders, meters, and safes. What’s New/Best Seller • IQ Self-Wash.
Advantages/Features • D&S has introduced a smarter solution for self-service car wash owners: the IQ Self-Wash. The new system is a compact self-service pumping system that is simple to install and operate. 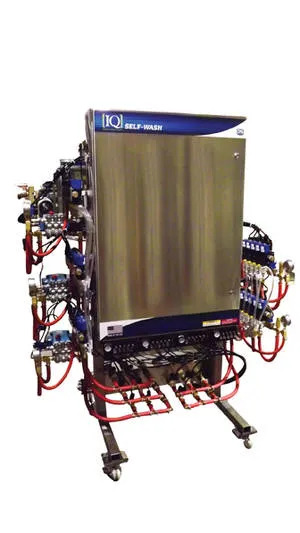 The IQ Self-Wash is extremely versatile and features direct injection of chemicals into the system eliminating the need for storage and mixing tanks. VFDs and direct drive pumps control the wash pressure for each function for optimum control of chemical delivery. Operating pressures are adjustable and all units are pre-plumbed and pre-wired for fast, efficient installation and maintenance. Delivery/Installation • Simple installation, diagrams, and complete instructions in operation manuals. Operator/Customer Support • Nationwide network of distributors and a toll-free customer assistance hotline. Price • Available upon request.